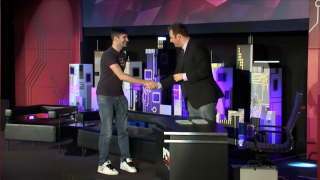 Dean Hall: "I stayed on DayZ for longer than I intended"
At the PC Gaming Show at E3 today, DayZ creator Dean Hall responded to anger over his departure from the game's development. According to Hall, he never expected the game—which originated as an Arma 2 mod—to become as popular as it did, nor did he expect to be working on the game for as long as he did. “It comes down to learning the lessons and I think that when I first came up with DayZ, it was an accident," Hall said. "It was a mod I thought 50 people would play, but a lot of people played it. I didn’t have the resources [to develop it alone] so I sold it to Bohemia, and I stayed [with the project] for a lot longer than I intended. "Ion is an example of a game I’ve always wanted to make," Hall continued, referring to the project he's currently working on using new Improbable technology, and which is nothing like EVE, Star Citizen or Elite.